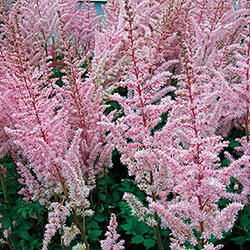 Astilbe are a garden classic, known as the easy floral interest for a shaded spot. The fluffy, graceful plumes hang overtop the dense foliage, and en masse they look like a field of graceful brush strokes—a real life impressionist painting. 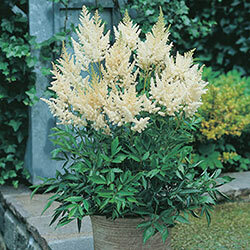 This type of astilbe is especially low-maintenance and tough. They're also rarely of interest to deer. So long as you keep them hydrated with loamy, moist soil (they aren't good with drought), they'll present fine flowers for years on end. The blooms are astonishing too. The fluffy, full and delicate look makes such a pretty bouquet or indoor arrangement. This collection will get your mass woodland planting started or give you a nice potted feature for a shady patio; it includes three top quality astilbe chinesis varieties. Foliage Type: Dark green compound leaves/leaflets ovate to oblong with serrated edges. 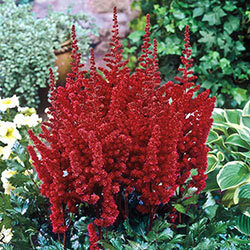 Flower Form: Spikes 20 - 30" tall, plume-like panicles of masses of small individual flowers. 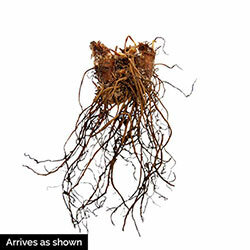 Soil Requirements: Fertile, organic soil, that retains moisture but not soggy. Pruning: Cut back to encourage new bloom.